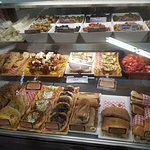 In the past I have also purchased the pasta with pesto, which I love... its v...deli of choice in MontebelloGot the olive medley which was excellent.... good and meal comes with a small Caesar salad and THEE best garlic bread. 4 flavors: original anise oil, traditional almond, pistachio cranberry citrus, double chocolate walnut. Flour, sugar, egg, butter, dried cranberries, pistachio nuts, orange oil, vanilla extract, baking powder, salt. Flour, sugar, egg, butter, unsweetened cocoa powder, semi-sweet chocolate, walnuts, vanilla, baking soda, salt. Flour, sugar, egg, butter, baking powder, cream, anise oil, whole anise seed. Flour sugar, egg, butter, baking powder cream, whole and chopped almonds, almond extract. All our pasta plates include your choice of pasta cut, your choice of sauce, garlic bread and a fresh crisp caesar salad. Choose your pasta cut spaghetti (traditional), penne (tubes), fettuccini (long flat noodles), farfalle (bow ties), cellentani (cork screws). Pasta favorites "made with love" all pasta plates include caesar salad & garlic bread. Traditional lasagna smothered in our specially prepared meat sacuce. Smothered in a creamy pesto sauce and topped with shredded parmesan . Sundried tomato & garlic sauce. Destroyer - serves 6. 3 sizes - same delicious sandwich. 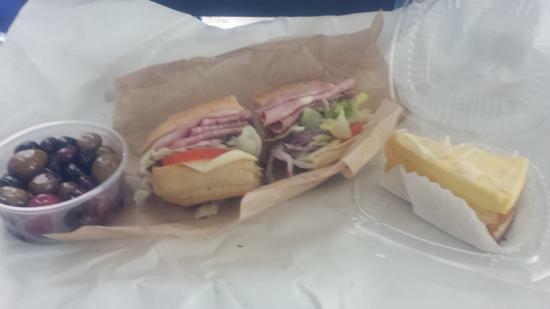 Our original italian combo loaded with mortadella, imported ham, cotto salami and provolone cheese. And garnished with mustard, mayonnaise, pickles, pepperoncini peppers, lettuce, fresh roma tomato, red onion, italian seasoning and topped with italian derssing. For just $2.50. 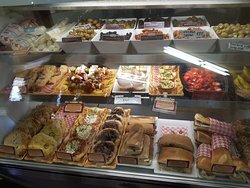 Make any 6" or 12"sandwich a mombo plate, choice of (2) side items: potato salad, macaroni salad, pasta salad, green olive salad, marinated artichokes, marinated mushrooms, caprisi salad, cole slaw, fresh fruit, green garden salad, caesar salad. 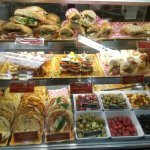 Turkey breast, smoked ham and italian grilled capocolla with mayonnaise, lettuce and fresh tomato. Fresh buffala mozzarella with marinated mushrooms and artichokes, roasted peppers and fresh tomato with italian dressing and a basil pesto spread. (Piled high & loaded!) Roast beef, turkey breast, italian dry salami, with spring greens, red onion, roma tomato & avocado on our toasted cheesy jalapeno snack bread. Roast beef, imported ham and turkey breast loaded with mayo, mustard, lettuce, tomato, dill pickle chips, and pepperoncini. Lean roast beef or turkey breast, melted swiss cheese, red onion, bell peppers, mayo, lettuce and roma tomato grilled to perfection. We marinate, season and bake our fresh chicken breast (with no yuckie additives or preseritives). Our tuscan herb chicken breast smothered in our marinara sauce, melted mozzarella and parmesan cheese. Our tuscan herb chicken breast and grilled cappocolo ham (italian bacon) with avocado, mayo, lettuce and roma tomato. 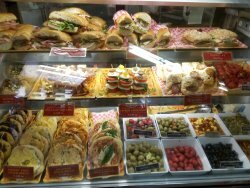 Our tuscan herb chicken breast with prosciutto ham, provolone cheese, marinated artichokes, red roasted peppers, black olives, roma tomato and our basil pesto spread. Italian proscuitto ham, fresh mozzarella cheese, roma tomato and fresh basil with a splash of balsamic vinegar and oil on a sourdough baguette. Roasted turkey breast, dried cranberries, fresh spinach and roma tomato with a honey mustard spread in a multigrain. I have lunch at Frumento's often. 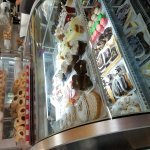 The variety of sandwiches, Italian entrees, salads and deserts are wonderful. The market also stock many hard to find Italian items. The party platters are equally delicious. I highly recommend this establiment. Great food, reasonable prices. Makes you feel like you are in Italy. Staff is pleasant, friendly and professional. Great food any time. Very convenient for catering. Great tasting quality food and generous portions. Love Frumentos. 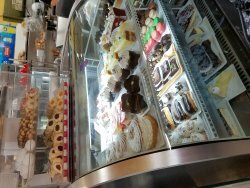 Get quick answers from Frumento's Italian Market staff and past visitors.